Hello guys! The lightning bolt's been away for a while, but it's back now! Did you miss it? ;-) For this double lightning bolt, I used the same technique as usual, only now the middle part is diverging, making the whole somewhat playfuller. As my previous attempts on using Gosh Holo as a layering color miserably failed, I used it as the base color this time (clever!). Which is time-saving too since Gosh Holo is a one-coater and fast-drying. Then I taped off the holo part and applied Color Club Where's The Soiree? on top. I must've said this like a gazillion times, but Where's The Soiree? is just wonderful for tape manis. It's so extremely pigmented and even when it's used over another polish, it dries with the speed of light. So quickly after that I was ready to tape my nails again and used Essence Bella for the tips. Done! 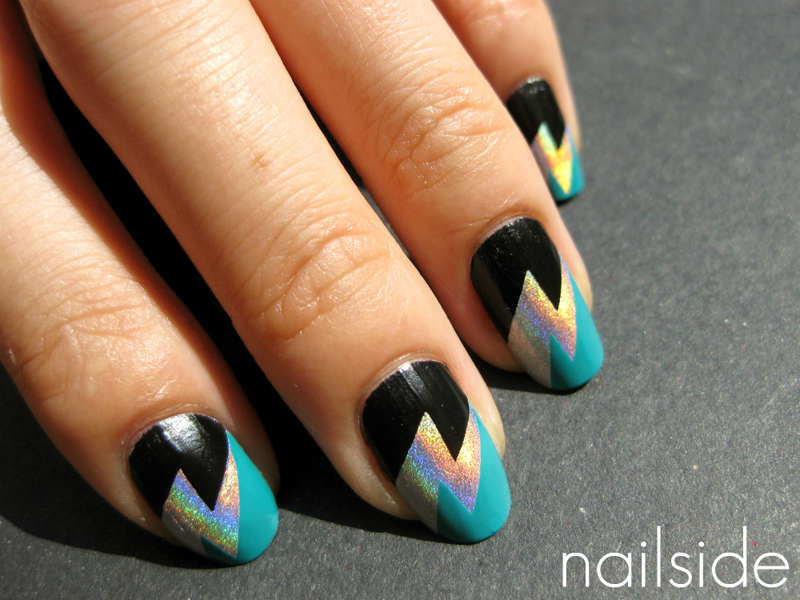 If you like this look just have a look at the tutorial for this design if you haven't already. I know it takes a lot of patience but practice really makes perfect and I've already seen many beautiful and succesful attempts from you! They make me proud :) Thanks for visiting! This looks amazing! The holo lightning bolt is really cool! This is amazing (as usual)! 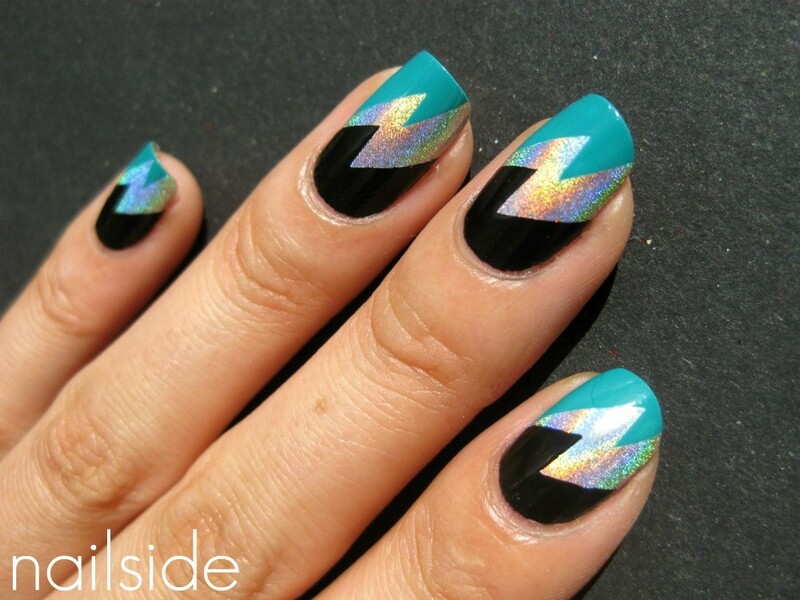 Love the holo lightning bolt, it's super catchy! Wauw, ik zoek die holo al zo lang maar hij is elke keer weg.. I LOVE the color combo!!!! Amazing as usual - or should I say even mroe amazing because of colour combo this time? :)This is def one my faves! please tell me how you do this pattern? very cool colour combo. I want that gosh sooo bad though haha I have zero holos unfortunately. Oh wow! So nice lightning! And this holo looks great ! 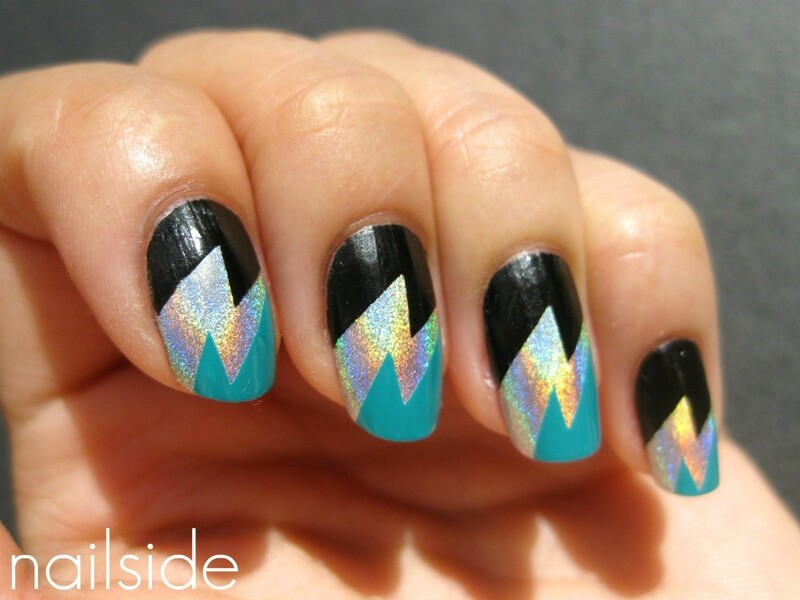 as usual, I'm mesmerized by your mani! I like this flashing double lightning bolt! This is actually incredible! I'm in love.... =] I think i'l be trying this out soon! I LOVE how this looks! I need to try it! whoa what a crazy combo and itworks so well! hope you follow back too! wow this looks amazingg! great idea with using the holographic!! Beautiful. It looks so perfect! Now THAT is lightening for sure! So awesome! @martell: I have a tutorial tab at the top where you can find the tutorial for this design. OMG! The holo sets it off. You're the Queen! You're great!! Beautiful color combination! That looks so amazing! The holo really matches the other two colours .. reminds me of superheroes and their costumes!